Wee Ones is a part of the total ministry of First Baptist Church Pflugerville. We seek to minister to parent and child, church members, and the community. We provide a Christian staff to teach age-appropriate curriculum and foundational concepts of God, Jesus, Bible, church, self, family, others and the natural world. 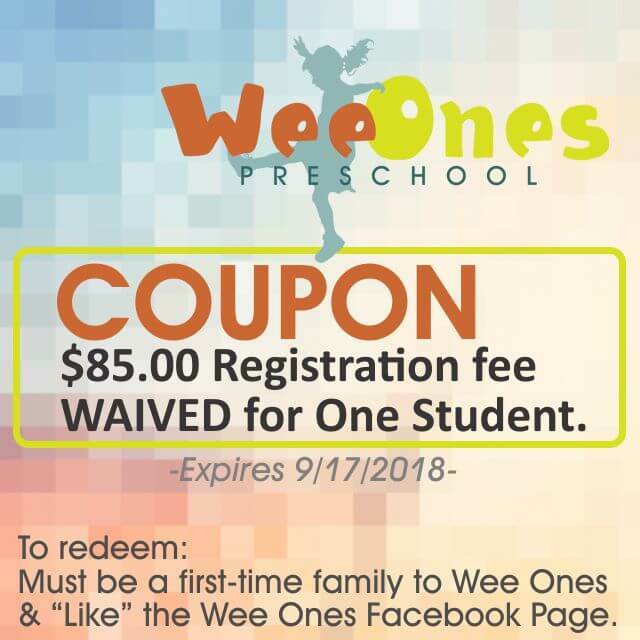 Wee Ones is a 2-day per week preschool for toddlers through 4 years old that meets on Tuesday and Thursday from 9:00 a.m. to 2:00 p.m. Wee Ones usually runs September through May, usually beginning the first Tuesday after Labor Day and follows the Pflugerville School calendar for holidays, etc. Call for availability in your child’s age group. Classes have limited enrollment so contact us early to enroll your child. Check out our facebook page! Click Here! For more information, call Carrie Roddy at 512-251-3052 or email her at the address you see on the right. When does Wee Ones meet? Classes begin in September, usually the first Tuesday after Labor Day, and go through the month of May. Classes meet Tuesday and Thursday from 9:00 a.m. to 2:00 p.m. The Pflugerville school calendar is followed for holidays, early outs, and school closures. Children are enrolled two days per week, both Tuesday and Thursday. What are Wee Ones Enrollment Requirements? Preschool children (toddlers to pre-kindergarten) may be enrolled depending on class availability. A waiting list is maintained for classes that are full. An application for admission and a child’s Health Statement must be submitted with a registration fee. Immunizations must be current before a child may attend. How much does Wee Ones cost? What is the size of classes for each age group? Class size is 8 students for toddlers, 10 students for the younger 2’s , 11 students for the older 2’s and 3’s, and 12-14 students for the 4’s. Each class has a teacher and a teacher’s aide. How many teachers does each class have? Each class has two teachers, a lead teacher and an aide. Our teachers love children and must meet certain criteria required by our FBCP Children’s Ministry, such as a background check. Are the children taught using a curriculum? Wee Worship is a fun interactive Bible story time for our preschool classes. Wee Music introduces the fundamentals of music. Each December the children participate in a Christmas music program and in May they present a music program. Wee Games gives the opportunity to enjoy organized games, recreational activities, movement, outdoor and indoor play, and helps develop gross motor skills. Throughout the year we offer preschool-wide fun days, including our Fall Festival, Jello Jiggle Jammy Day, Texas Day, and Sundae Fun Day. Holidays such as Thanksgiving, Christmas, and Easter are celebrated in each class. Wee Ones follows the Pflugerville School calendar for holidays, early outs, and school closures. Our 3’s take two field trips each year, such as Crowe’s Nest Farm and Pflugerville Park. The 4’s classes take several field trips during the year. Places they might visit are Dino Park, a dentist office, a fire station, a zoo, a Pflugerville elementary school, etc.